Today Samsung unveiled two new devices which are the 5.3-inch Galaxy Note and the Galaxy Tab 7.7 at IFA conference in Berlin today. The Galaxy Note is to be used with a pen and takes input from it while the Galaxy Tab 7.7 is the first tablet to feature a Super AMOLED Plus display and will run Android 3.2 Honeycomb. The Galaxy Note is 9.65 millimeters thick and has a 1.4GHz dual-core processor, 16 or 32GB of internal storage, a rear 8-megapixel camera, and a front 2-megapixel camera. Samsung is not referring to the Android 2.3 Gingerbread device as a tablet, can be used with an “S Pen” to capture notes and drawings. The device will be HSPA+- and LTE-capable but no carriers are assigned to it yet. It will be interesting to see who would be willing to start off offering this tablet. 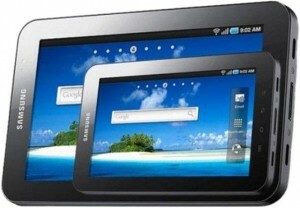 The Galaxy Tab 7.7 also has a 1.4GHz dual-core processor, is 7.89 millimeters thick and weighs only 12 ounces. The tablet will run Android 3.2 Honeycomb skinned with Samsung’s TouchWiz interface, and is not a 4G LTE device, capable of only HSPA+ connectivity. Samsung says the Tab 7.7 will get up to 10 hours of video playback with its 5,100mAh battery and will come in 16/32/64GB storage configurations, all expandable by an SD card slot. Neither prices nor release dates have been announced for the devices. Next Amazon Kindle Tablet to Launch in November!